The Newport Gwent Dragons have received a massive boost ahead of their RaboDirect PRO12 derby with the Cardiff Blues with the news that Wales duo Toby Faletau and Lloyd Burns have both penned new deals with the region. 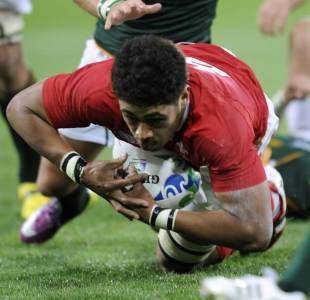 The pair have extended their contracts up until the end of the 2013-2014 season, with Faletau explaining that he remains as committed to the Dragons cause as ever in spite of the interest he received on the back of his stunning performances during the Rugby World Cup in New Zealand. "The World Cup was a great experience but I'm really looking forward to getting back Rodney Parade," the Tongan-born No.8 said. "I just love to play rugby and I enjoy being at the Dragons." Burns, meanwhile, was only to happy to extend his contract with the Dragons given that the integral role the region has played in turning him from a semi-professional into a Welsh international. "It was a pretty simple decision for me," he said. "The Dragons are my region and I want to stay with my local team. "The Dragons have been really good to me and it's where I want to be. I'll be back in training next week and am really looking forward to getting back in with the boys and taking on the next challenge."